Teach your child about faithful men of the Bible as well as the consequences of sin with these full-color visuals. 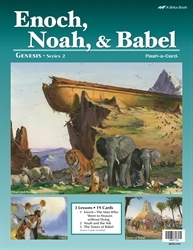 With 3 lessons and 19 pictures, teach your child about the man who went to Heaven without dying, Noah and the Ark, and the Tower of Babel. Also included is a detailed lesson guide that gives you content to teach, prompts to use the pictures, and review questions for each lesson. Use these beautifully painted pictures to teach your child about life before and after the flood.